The Department of Hawaiian Home Lands is currently re-examining the Administrative Rules governing department operations, and proposing to remove, add, or modify these rules to meet the changing needs and priorities of our beneficiaries. The department plans to propose several rule changes throughout the course of this administration. Rulemaking could take up to two years to complete. The department is currently wrapping-up the first round of proposed rule changes related to the following three topics. Genetic Testing: Proposes DHHL accept DNA tests to establish family ties in order to qualify for the Hawaiian Home Lands program. Lease Transfer: Proposes a process and requirements for transferring a vacant homestead lot (i.e. a lot with no home or other improvements built upon the land). Subsistence Lots: Proposes a new option in DHHLʻs agricultural program that supports a subsistence rural lifestyle. From October 27, 2015 to December 10, 2015 the DHHL conducted statewide beneficiary consultation meetings to discuss with and get feedback from beneficiaries about the first round of proposed rule changes. In all, ten consultation meetings were held and over 700 beneficiaries attended. The format used at the consultation meetings was designed to solicit beneficiary input through facilitated conversation focusing on how the proposed amendments could be made better. 1 Proposed Action or Issue for Discussion Update the current set of Hawaii Administrative Rules governing the Department of Hawaiian Home Lands. 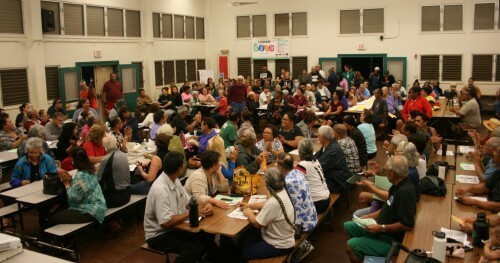 Beneficiary Consultation Meeting with Lānaʻi Hawaiian Home Lands Beneficiaries, letter mailed October 13, 2015 to all Lānaʻi lessees and applicants. Beneficiary Consultation Meetings with Hawaiian Home Lands Beneficiaries, postcard mailed October 19, 2015 to all lessees and applicants. Public Hearings Notice, published in the Hawaii Tribune-Herald, West Hawaiʻi Today, Maui News, Honolulu Star-Advertiser, and Garden Island on Friday, November 4, 2016. All meetings scheduled to run from 6:00 – 8:30 p.m. but subject to change. All meetings scheduled to run from 6:00 – 7:00 p.m.
2014 DHHL Applicants Survey Report – Beneficiary study conducted every five years indicates agricultural applicants’ preference for subsistence farming (pg. 7) as primary goal of agricultural lot use.